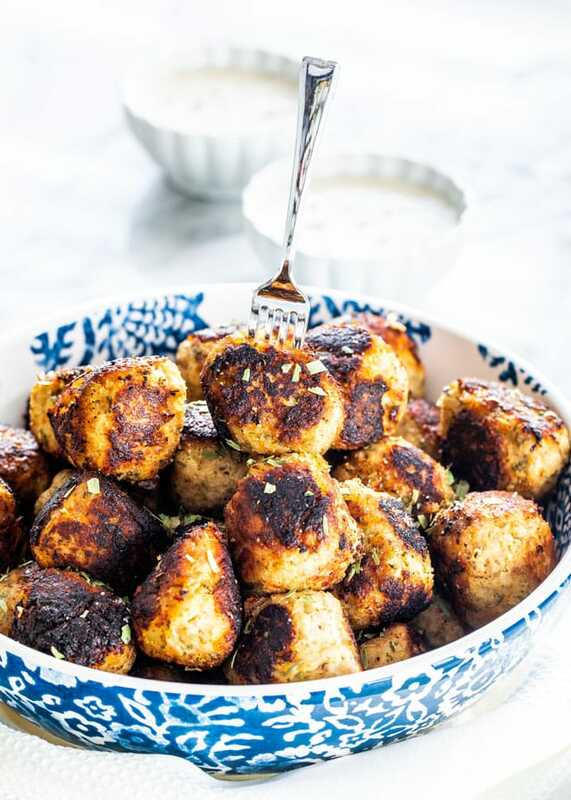 These Sweet Potato Turkey Meatballs feature an interesting combination of ingredients that gives you the most superb, soft and delicious meatballs served with a creamy maple dipping sauce. Perfect for an appetizer and a total crowd pleaser! It’s time for Monday Meatball Mania again! Monday Meatball Mania is about giving you guys a new meatball recipe, whatever crazy and tasty meatball concoction I can come up with, no rules. Anything goes. Why meatballs? Because meatballs are great, they’re versatile, and they’re great in and on everything, not to mention they are an inexpensive blank canvas. You can bake them, you can fry them, you can slow cook them, you can stuff them with cheese and make them all gooey and delicious, they’re great in sandwiches, spaghetti and meatballs, meatball casseroles, meatballs in soups, meatballs on pizza, I’d even put them on a salad, the sky is the limit. Today’s meatball recipe is perfect for this time of the year. Sweet Potato Turkey Meatballs! I have to say that these are the softest and most tender meatballs ever and the flavors are divine! Maple syrup and sweet potatoes? You know that’s a combination made in heaven! Make sure you pick the right meat. Usually it’s best to pick fattier meats like beef, lamb or pork because this will result in tender meatballs. 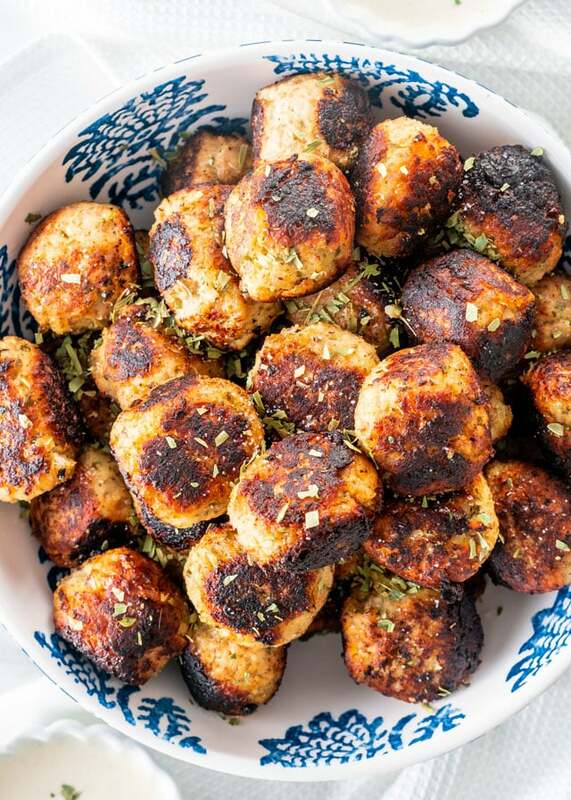 However in this recipe, I used turkey, chicken can be used as well, but you don’t have to worry about these meatballs being hard as a brick because the secret ingredient here is the sweet potato, which makes these meatballs super tender. Make sure you don’t over cook the meatballs because this can also result in tough meatballs. As always, don’t be afraid to use a blend of different kinds of ground meat, for great flavor. If prepping the meatballs ahead of time, make sure you refrigerate them. You want to make sure you keep them cold, to keep the fat from melting. Season generously! My mom always would taste the meat mixture, whether she is making cabbage rolls, meatballs or meatloaf. However, I don’t recommend doing this because it is raw meat. Make a little meatball and fry it first, then taste it. Nobody wants an under-seasoned meatball. When forming meatballs, it’s easier to form them if your hands are wet. Better yet, use a small ice cream scoop, this way all your meatballs will be uniformly-sized and no dirty hands. Serve them as an appetizer with the creamy maple dip. Place toothpicks in each one, or use these small plastic appetizer forks. Not only do they look pretty but no washing required, just throw them out when your guests are done. Serve them with mashed potatoes. These meatballs would be perfect for your Thanksgiving table as a main course with mashed potatoes or steamed vegetables. Serve them over rice or your favorite bread. In a large bowl, mix together all the ingredients for the meatballs except for the oil. Make sure the mixture is combined well. Heat about 2 tbsp of the oil in a large skillet. Add the meatballs and fry until golden all around, about 7 minutes. 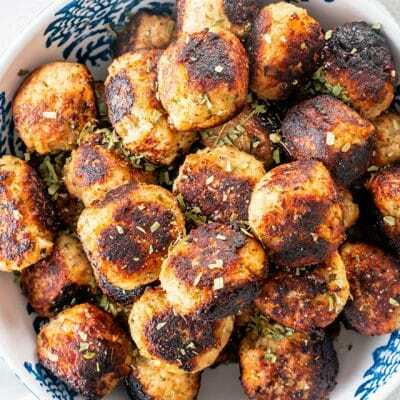 You will have to do this in 2 batches, so do not overcrowd the meatballs. Fry the meatballs in the skillet, a few at a time, turning them around so that they fully brown on all sides about 7 minutes. 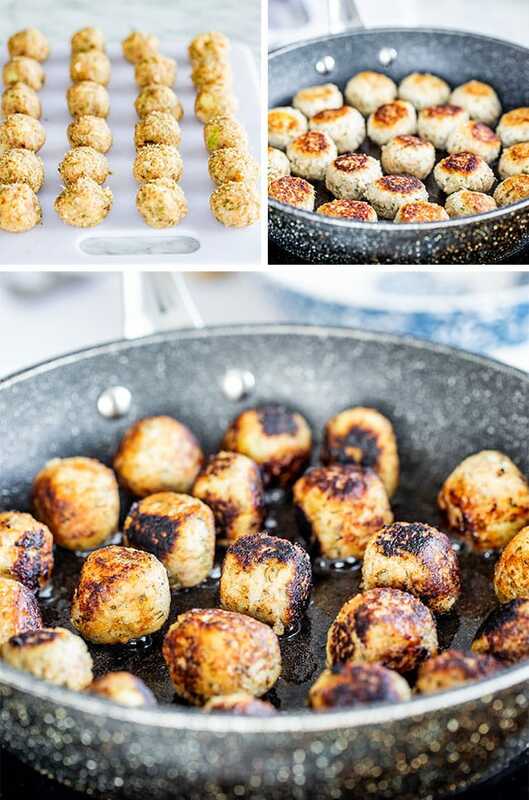 Transfer onto a plate and repeat with all meatballs. 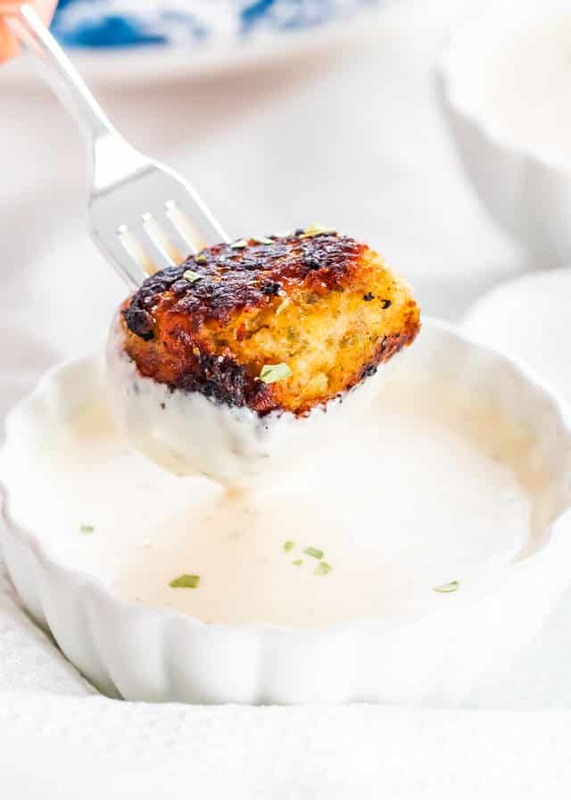 In a small bowl whisk together all the dipping sauce ingredients and serve with meatballs. This recipe yields approximately 30 meatballs. Sweet potatoes: I have used both white sweet potatoes or the red skinned sweet potatoes for this recipe and they both yield the same result. You will need about 3 to 4 sweet potatoes to yield 2 cups mashed. How to cook sweet potatoes: I cooked mine in the microwave. Before placing them in the microwave, wash them then pierce them 5 to 6 times with a fork. Wrap each sweet potato in a paper towel then place them in a microwave safe plate. Cook for about 20 minutes in the microwave at full power. To check for doneness, stick a fork in the center of the potatoes, and if the fork goes in easily , but the center is still a bit firm, the potato is ready. Baking directions: Coat a baking sheet with cooking spray, or use a baking rack. Bake at 375 F for 30 minutes until golden brown. Freezing: To freeze the meatballs, let them cool completely at room temperature. Transfer them to a freezer safe container and place them in the freezer for up to 2 months. Leftovers: Refrigerate leftovers in an airtight container for up to 3 or 4 days. Make the dipping sauce before serving. Nutrition: Nutrition information is based per meatball plus dipping sauce. Please keep in mind that nutritional information is a rough estimate and can vary greatly based on products used. I’m wondering if the recipe is not supposed to include the 4 tbsp. in the meatballs… it says to mix all ingredients together which is what I did… but later states to use 2 tbsp. of the oil for the pan. It ended up in slimy meatballs. Hi Shannon, I’ve just updated the recipe. Thank you for catching that! The oil is meant only for frying, and not to be mixed into the meatballs. The bad news: the meatballs would not hold together I ended up just baking it as a meatloaf. The good news: this was so tasty. I would make it again and use it as a filling for stuffed peppers or for a meat pie. Oh that’s interesting. The sweet potato should help with holding the meatballs together. Next time maybe try adding a bit more breadcrumbs, that might help a bit. Glad you liked the taste though. What would be the temp and time if you decided to bake these? I’d bake them at 375 F degrees for about 30 minutes. Any thoughts on what i child pair as a dipping sauce? Perhaps a spicy yogurt dip would be nice.